Have we seen peak EUR? The euro is up 12% against the USD this year. We haven’t seen this kind of euro appreciation for quite some time, as the ECB was the last central bank to go ‘all in’ on monetary policy. 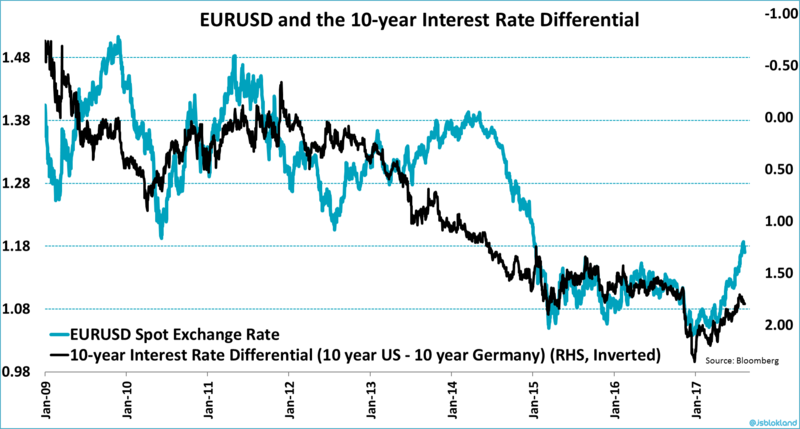 In recent days the EURUSD has reversed some of its gains, which raises the question if we have seen peak EUR for now. Ever since the outbreak of the financial crisis, the EURUSD exchange rate is dictated by (relative) monetary policy of the Fed and the ECB. This is shown by the relationship between the US – Eurozone short-term yield differential and EURUSD in the chart below. 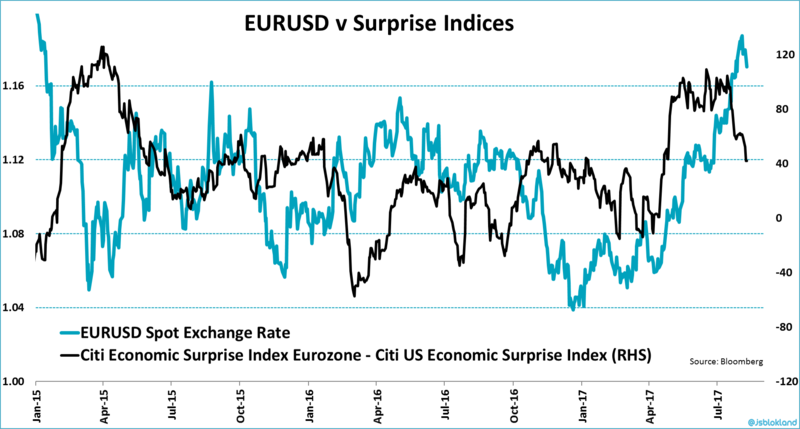 While this relationship is certainly not perfect, the chart reveals that the euro appreciation is significantly larger than short-term rates would suggest. This implies that EURUSD investors expect the difference between 2-year bond yields in the US and the Eurozone to decline. Even though this is not very likely to happen because the ECB has stressed over and over again that rates will remain low for considerable time. From this angle, the euro appreciation looks overdone. 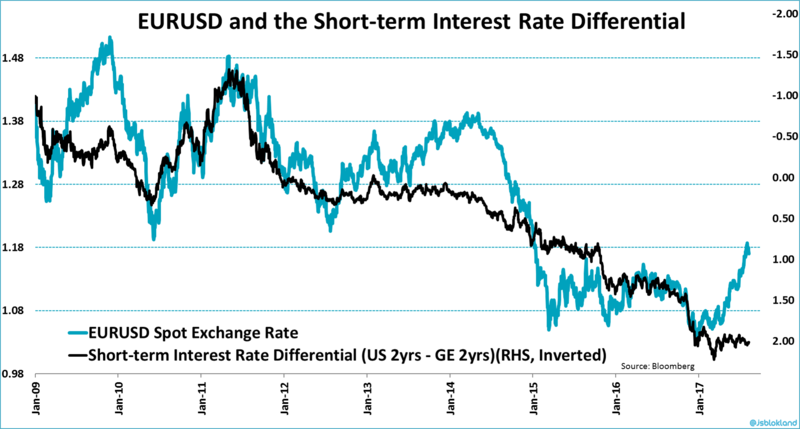 By the way, the same conclusion applies for differences in real short-term rates (not shown). So what about longer-term bond yields? They should be a better reflection of growth differentials between the US and Eurozone, and less effected by central bank policy. However, the chart below shows strong resemblance to the first graph. This isn’t that strange since current monetary policy extends way beyond short-term rates. This is especially true for the Eurozone, where the ECB buys EUR 60 billion of bonds each month. Monetary policy is impacting yields along the yield curve. With the Eurozone economy now growing faster than the US economy, the euro is able to reflect the growth differential, whereas ECB policy prevents this from showing up in bond yields. Having said that, the gap remains significant. Especially if we take into account that macro surprises are turning. Until recently, economic data in the Eurozone beat expectations by a fairly wide margin, while US macro data disappointed. But that trend has started to reverse, which, as the graph below reveals, puts downward pressure on the EURUSD exchange rate. Speculative future positions, however, suggest otherwise. There has been a steady build up in long euro futures during the last couple of months. Based on the graph below, the EURUSD should be close to 1.50, instead of 1.20. Obviously, this would be a bit too much, since scaling has become problematic for all EURUSD charts after the massive drop in 2014. The direction, however, is pretty clear, up not down. Also notice that while the amount of net long positions is close to the highest level since the start of 2009, they’re not extreme when compared to the amount of net short positions we have seen in recent years. 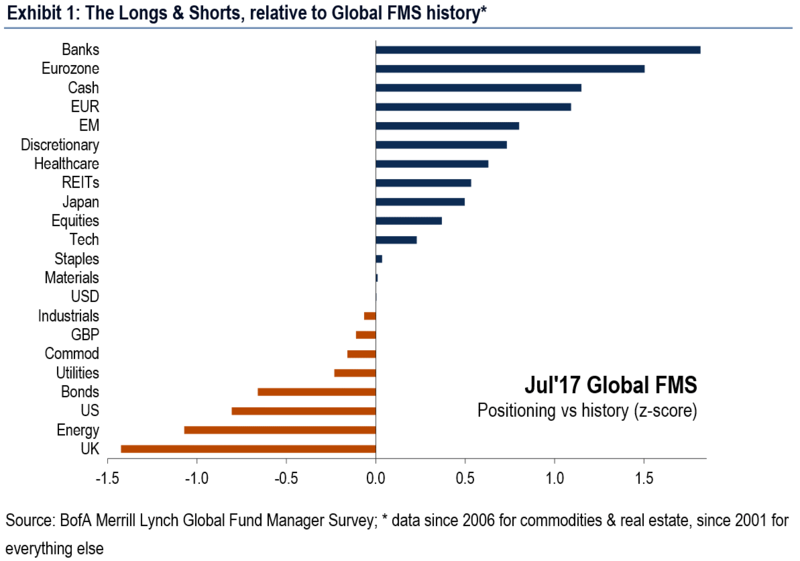 While there is certainly room to add long euro positions from a futures perspective, positioning data from BofA Merrill Lynch’s Global Fund Manager Survey reveal that investors are already long the euro. This limits the upside potential of the EURUSD from this angle. Finally, a quick look at EURUSD exchange rate history shows that since 2009 we have had four major euro rallies, including this one. 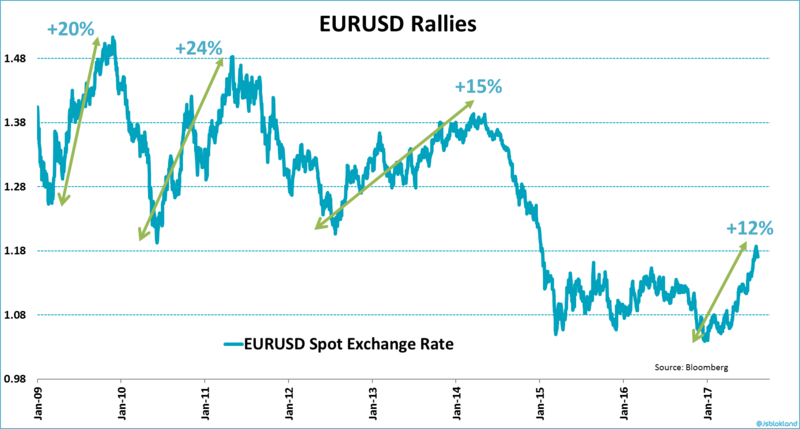 During the previous three, the euro rose more against the USD than currently is the case. What to make of this mixed bag? 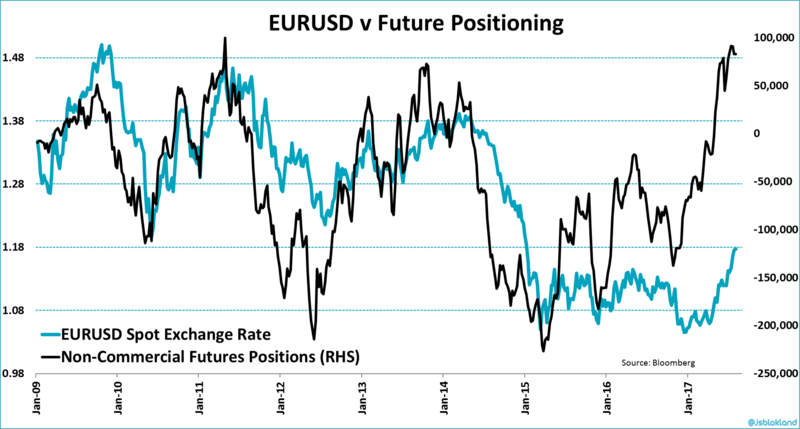 First, focusing on the near-term, the current EURUSD move does look a bit stretched. The exchange rate has deviated from bond yield differentials, something that does not make complete sense given the expectations for short-term rates. The gap between 2-year bonds yields in the US and the Eurozone will be with us for quite some time. In addition, markets seems a bit complacent on the Fed and the strength of the US economy. Another rate hike this year has been priced out, but given the recent uptick in economic data a bit of a euro pullback seems likely in the short-term. However, before the rally started the euro was significantly undervalued, caused by a late and massive policy response from the ECB. The recent rally closed part of that valuation gap, but it remains cheap. Based on The Economist’s Big Mac Index, the euro is still 14% undervalued compared to the USD. The same holds for PPP valuation measurd by the OECD. Also, the size of the gap between US and Eurozone interest rates remains historically large. Any kind of ECB taper will probably decrease that gap, resulting in upward pressure on EURUSD. Hence, longer-term more euro appreciation is on the horizon. ← Why Does the Bitcoin Fork Make You Richer?